When Zamalek institution, La Bodega, closed down at the beginning of 2014, it left a hole in many a heart. While a beachside iteration has since popped up on the North Coast during Sahel Season, its closure has certainly left a gap that not even its replacement, the phenomenal U Bistro, has been able to quite replace in the same way. But remnants still remain in the form of sister venue, Aperitivo, located on the same floor of the same building. It’s by no means similar in appearance or, one could argue, atmosphere, but La Bodega regulars have adopted it as a replacement and the spirit is very much cut from the same cloth. For those not familiar with Aperitivo, the bar and restaurant maintains a classic element in its décor and design (think wood and glass cabinets displaying various piece of crockery and ornaments) while also using various more modern pieces (the chandeliers are very cool). Divided into two sections – the bar and the restaurant proper – there isn’t a lot that will jump out at you in its appearance; but that’s the best way to be for a venue of this standing – demure and unpretentious. There’s been something of a revolution happening at Aperitivo as of late, including the launch of a new menu; one that walks the line between high-end culinary delicacy and the kind of wholesomeness you get with bistro food. The concise but varied menu covers soups, salads, meat and poultry dishes, as well as pastas and seafood, which is where we began our evening. 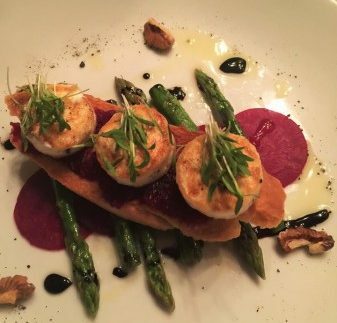 We rarely give up the opportunity to try a dish with scallops in it – not only because it’s a rare commodity in Cairo, but because it’s also often mishandled, which felt like the case with Aperitivo’s seared scallop starter (155LE). While it was a creative and enticing dish, the scallops were slightly overcooked, the accompanying black truffle was too little, though the spiced apple puree that also accompanies the dish gave a pleasant sweetness to every bite despite tasting more like a beetroot puree. Meanwhile, four sticks of asparagus were cooked and seasoned perfectly, while a faint balsamic reduction did little to elevate the rest of the ingredients. Among the menu’s salads, we were seduced by the camembert salad, which brought together generous chunks of deep-fried camembert cheese together with mixed greens, roasted pears, sundried tomatoes and walnuts. The greens were fresh, the sundried tomatoes added a sweet acidity to thick, pungent cheese and the walnuts gave the whole dish an earthy touch. However, the pears were undetectable, which is a real shame as it could have been the ingredient that brought everything together. While various mains are included in the new menu, we decided to test the kitchen’s mettle with meats. Despite being served with far too much uncooked fat, a medium-cooked sirloin steak (150LE) was full of flavour and served in a very big portion, alongside some perfectly made oven baked vegetables. Our second dish, the roast veal fillet, was also of a noticeably good quality and served in a large portion, though it was unevenly cooked, meaning some pieces were a little tough and others had a perfect pink interior. Unfortunately, there was not much else to talk about with the mains, despite the menu promising more; the veal dish, for example, should come with roast pumpkin ad soft polenta, but both were missing from the plate, as was the roasted garlic on the steak dish. This, actually, defined our meal; what we were served was well-made, but with so much missing from both mains – as well as the missing pear from the salad – severely dwindling what promised to be a fine evening of fine dining. Would we go again? Absolutely – the new menu reads fantastically; but maybe the kitchen needs a little more time to perfect it. The menu also features several sharer dishes that are perfect for bar-snacking - think from bruschetta and mini meat skewers, to chicken liver pate and shrimp terrine. The menu, on paper, looks fantastic and affords a lot of different options, while the atmopshere and service are top-notch. Key items missing from several dishes and small missteps in the execution of others.